My plane has just landed. I step onto familiar surroundings. The heat feels familiar. The sky looks familiar. Everything looks familiar as if nothing has changed in this city. It feels like yesterday, even though I’ve left this city for years. The arrival lounge is also similar to my memories of it, men holding the name-tag, people offering a rent car or queuing for taxi. Everything seems frozen in time. I walk to my assigned meeting point, through some kind of underground tunnel, connecting the airport and the parking lot. I love this tunnel, it is large with a minimalist ornaments. It gives me a calm feeling with its pastel paint. Sounds from the railway above it give me thrill sensation, like I am going to crash the train. I wait for a driver from my client’s company outside the tunnel and when I look around me, I realize that the parking lot is larger than I ever remember. Finally, a minor change that reminds me this city is no longer the same. Traffic outside the airport is not so crowded, maybe because it is an early Saturday morning. The driver asks me whether I want to stop for breakfast. I don’t feel hungry, but a cup of coffee would be nice. He stops in a small coffee vendor not so far from the airport. I feel glad that this driver is not a chit-chat person, I already feel exhausted with all the memories that are flooding my mind since I arrived here, in Yogyakarta, a city once I loved so much. The sun is shining so bright this morning, but the breeze is cool and the coffee taste so good. Lovely morning, if I don’t remember that I am in a city where my worst nightmare happened. Clear horizon with Mount Merapi as background takes me to years ago when I arrived here for the first time. Nearly 10 years ago. I remember coming here with high spirit and big hope, exploring this city with a great excitement and laughed at everything I never see in my hometown. I hope I can re-experience those feeling again, maybe those are the remedy for my bitterness feeling of this city. Yogyakarta. Special District. Cultural City. Full of students, from around Indonesia and overseas. Famous for its diversity. Famous for its myths. It has an imaginary line that goes straight from Mount Merapi to Kraton Ngayogyakartahadiningrat (Yogyakarta Palace) and finish in Parangtritis Beach. The most southern part of yogyakarta is a line of beaches. Many beautiful beaches. My mind takes me to one fine afternoon, when my thesis deadline was getting closer and i didn’t have enough spirit to finish it on time. Instead of writing it, I drove my car to Depok Beach. I love Depok Beach even though the sand is not white but it has fish market which sell fresh fish from the sea. I arrived at the beach in time to watch the sun started to set. Magnificent. The sky’s color was changing from bright blue to orange and finally lost in the darkness of night. I love spending my early night at that beach. Fishermen were getting ready for night fishing. People were packing their bags to go home. Sea waves were getting higher and the sound of the wave soothed my chaotic mind. I felt calm and my mood was much better when I came home that night. I am longing for that place, even more, I am longing for that calm feeling. I am longing for my happiness. The car is back on the street, smoothly driven to Malioboro Street. The most famous tourist destination in Yogyakarta. The place where my client is waiting for the briefing. 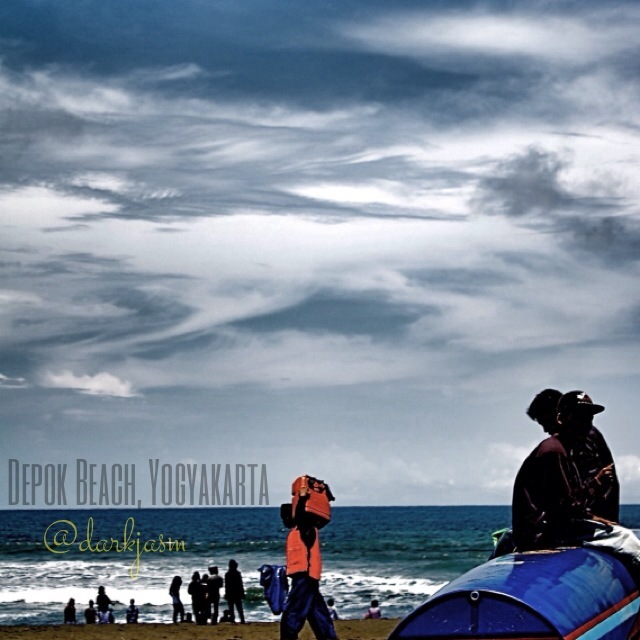 I guess Depok Beach has to wait a little longer. This is for the Day 2 assignment of writing 101. Can you see Yogyakarta as I see it? It is actually a fiction and I intend to keep it going through this month challenge..
Posted in Fictions, Poetry and tagged dailypost, day 2, depok beach, view, writing 101, Yogyakarta. Bookmark the permalink. Ndak ada versi bahasa jawa nya ni?